Some 2.5 million eth, or slightly more than $400 million, is now locked in dapps as decentralized open finance (defi) continues to grow (pictured above). MakerDAO’s DAI smart contract continues to dominate by far, with 2.2 million eth locked in there, allowing 20,000 people to hold dai. In second position is arguably the Ethereum Name Service (ENS) which back in June 2017 by itself held about half a billion dollars worth of eth. That has now fallen from ◊2 million to 159,691 eth ($27.9M), allowing individuals to create humanly readable eth addresses, like trustnodes.eth rather than the random numbers and letters that make up our donation address at the bottom pages. 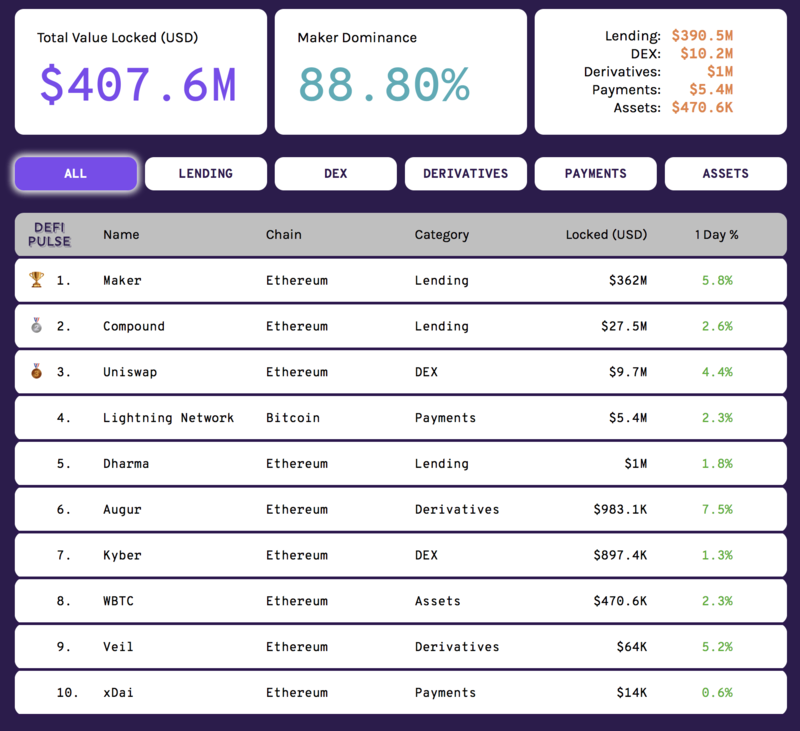 Then comes Compound, a very interesting dapp that allows you to borrow and gain interest by lending eth as well as a number of other tokens, including dai. This now secures close to 40,000 eth, with the total value of all assets in there standing at circa $27.5 million. Crypto amounts locked in dapps, April 2019. Uniswap is rising in usage, up now from about $1 million in February to circa $10 million or close to 30,000 eth. 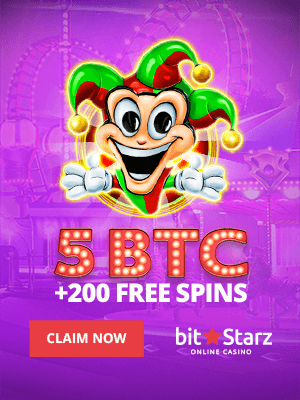 The only other decentralized exchange listed here is Kyber. They had an article of their own detailing how their ecosystem is doing. In that article they mention Nuo, a new dapp that allows one to margin long or short bitcoin eth or MKR, as well as allows one to lend their assets. Apparently $1.6 million worth of eth (and presumably other assets) is now locked in there, with it being just one example of projects/dapps that have not yet made it to stat pages presumably because such pages are very new. This entire defi field in fact is we’d say only 4-5 months old because after dai launched around the beginning of 2018, everyone was waiting to see whether it will actually work, whether it will be hacked, and so on. Some pioneers showed the water is safe-ish, so more confidence was gained with other dapps then building on that new area of financial ethereum applications. 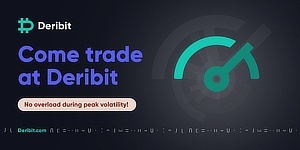 The billions that were raised starting in 2016 eventually begun to translate into working products last year, with defi being one outcome of things you can now do with your eth. You can sort of have all of the tokenized S&P500, and that has $1.1 million dai in their smart contract, with that project very much brand new. One can imagine it expanding into effectively any asset of value, perhaps even as abstractly as the entire shipping industry or maybe the whole European Union economy. That being the fruits at near the top of the tree, but for now even those laying on the ground are not yet being picked, so there are plenty of far easier applications as this space continues building the Windows 95 MS Paints. While that goes on, there’s the protocol level sort of defi with the Proof of Stake testnet now out. That will give an interest rate of 2%-6% according to Vitalik Buterin and a very rough translation. Interestingly phase 1 of sharding, that is the chopping up of storage, may now launch in Q1 or Q2 of 2020. That technically means they’re keeping to the deadline we have given them jokingly (sort of), but “real” sharding is “delayed” by a year as it will now hopefully go out in 2021. That’s what one would have expected, so it kind of appears like all is going to plan because all these dapps and so on do need some work on UI, testing out, improvements on every front, with this potential two years period giving them the needed time. Then when sharding launches hopefully these dapps won’t be so bleeding edge any more, but sort of at least semi-cutting edge. Do you have a link to the site you snipped? Where can you see this information directly?